This is rehearsal demo 2007. Re-mastered and re-recorded versions of the tracks (without track 5) from this demo later were includes in "Traurer" album 2007. All music and lyrics written and recorded by Sergiy Fjordsson at rehearsal room between Spring - Summer 2007. Originally only few copies without any cover were made and given to some close contacts. All front and inlay photos for all editions were made by Sergiy Fjordsson at the old small cemetery "Grobnik" in the depths of Rivne town. 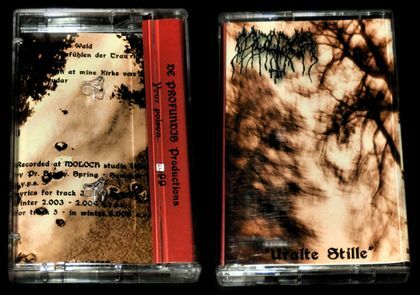 This is first edition, released via my own De Profundis Productions (Ukraine). Cassette tape with one sided color cover printed on photo paper (Catalogue number: Прах 073). Limited to 99 copies. This is edition of Russian label Algiz Productions. Printed in 2007. Limited to 50 copies. 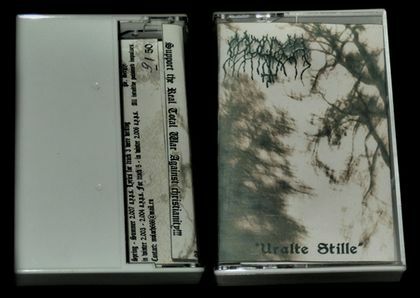 Cassette with one sided sepia-color printed cover. Catalogue number: AD-35. This is edition of Contempt Productions (Algiz Productions sub-label). Printed in 2007. 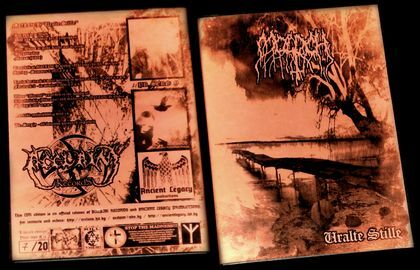 CDR limited to 50 copies with 2 sided sepia-color pro-cover inlay in slim case. Catalogue number: CD-013. This edition includes video "Morast". video "Morast" (Recorded in the woods of Ploskyriv /Khmelnitskiy - Ukraine. Spring 2007. This is the first video ever made by Moloch. Very primitive quality or recording and video engeneering.). Author of the front and back cover photos are unknown. Cover designed by the label owner. 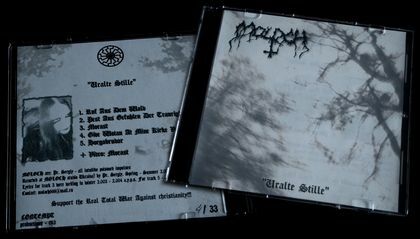 This is edition of Unholy War Productions (Brazil). Printed in 2008. Cassette limited to 1000 (or 500 ?) copies with one sided black/white pro-cover. Catalogue number: U.W.P. 004. Here are no any Digital, CD and Vinyl versions of this Demo. Горькой полынью прорасту на тропе..
чтобы рождались отныне в свете черни былой. и жажду пусть дождь утолит лишь на время. где находят покой свой зимние слезы. Но ведь жизни столбы продолжают стоять. и, оставив в земле, ушла в никуда чтобы себя возродить. Уйти бы долой, и скульптурой застыть..
Прорости бы корнями, да тверды снега..
созидать, не цепляясь за прогнившую нить. и кровью моей просочатся сквозь земь. Но время сильней, и цепляясь за плоть хоронит себя. Оно не бессмертно. не для людей. Пусть созидает с болью моей. So since now they'll be born in the light of the old blackness. Where the winter tears find their rest. And, having left in the ground, has gone to nowhere to resurrect itself. To create without crutching at the rotten thread. But the time is stronger, and clutching at the flesh, it buries itself. It's not immortal. Not for humans. Let it create with my pain.